One can easily understand why this story swiftly became Coast Guard legend...but its dim wall-of-grey visuals and narrative longueurs make much of the two hours a challenge to the attention span for viewers of any age. 117 min. Walt Disney Pictures. Director: Craig Gillespie. Cast: Chris Pine, Holliday Grainger, Casey Affleck, Ben Foster, Kyle Gallner, Eric Bana. The latest true-life adventure from Disney isn’t an animal documentary or a sports drama, but rather a tale of Coast Guard exploits. Shorn of the sea-salty language that probably attended the actual events, the 1950s-set disaster-rescue story The Finest Hours fits the Disney métier just fine, but its dim wall-of-grey visuals and narrative longueurs make much of the two hours a challenge to the attention span for viewers of any age. Three screenwriters (Scott Silver, Paul Tamasy, and Eric Johnson) share credit for adapting Michael J. Tougias & Casey Sherman’s non-fiction book The Finest Hours: The True Story of the U.S. Coast Guard's Most Daring Sea Rescue. While necessarily simplifying (and, at times, unnecessarily Hollywood-izing) the true story, the film adheres to the basic facts: in 1952, with a nor’easter battering the seas off Cape Cod, two oil tankers break in two more or less simultaneously, dividing the Coast Guard’s resources in mounting rescue efforts. And so it is that the coxswain of motor lifeboat CG-36500, Bernie Webber (Chris Pine, providing solid anchorage), leads a crew of three (Ben Foster’s Seaman Richard Livesey, Kyle Gallner’s Engineman Third Class Andy Fitzgerald, and John Magaro’s Seaman Ervin Maske) to find the SS Pendleton and bring home alive its 33 mates. In an effort at gender inclusion (and shore-bound tension), The Finest Hours begins by establishing the courtship of Webber and his eventual fiancée Miriam (Holliday Grainger), who frets and struts her finest hours in the Coast Guard station, berating Chief Warrant Officer Daniel Cluff (Eric Bana), and along the coast, waiting for Bernie’s boat to come in. Most of the picture toggles between the Coast Guard effort and the struggles of the crew aboard the stern section of the Pendleton, most notably chief engineer Ray Sybert (Casey Affleck, best in show)—who assumes leadership and proffers a plan to hold out in hopes of rescue—his tough-as-nails ally “Pops” (Graham McTavish) and a Doubting Thomas named Brown (Michael Raymond James). The ragtag crews facing gale-force winds in the waters off Massachussets inevitably brings to mind The Perfect Storm, but The Finest Hours, while probably a tad more authentic, lacks that film’s vitality. Director Craig Gillespie whips up some eye-catching camera moves, the visual effects generally convince, and one can easily understand why this story swiftly became Coast Guard legend. But there’s too little of drama to compensate for our knowledge that a Disney-branded film about a rescue effort will end with triumphant uplift: the rescue itself, once it finally arrives, gives the film a second wind, but too much screen time follows that true climax. Gillespie’s gambit to let the drama steep is reflected in his choice of Carter Burwell to score with his unmistakeable, folksy, slow-walking tension, and the studio’s post-production choice to goose the picture with 3D conversion. Although the characters tend to the stock and the film’s long midsection sags, The Finest Hours does a respectable job of telling, as tribute, its story of real-life heroism. 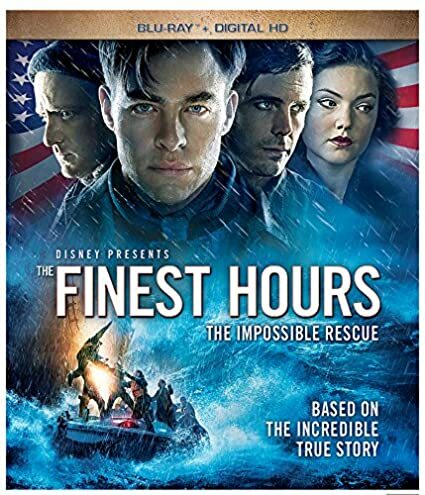 Disney's domestic home-video release of The Finest Hours is something of a mixed bag: disc-based home-video enthusiasts will be disappointed (and they're a dwindling lot, after all) by the inconsistent support Disney is showing to 3D Blu-ray, offering this title in 3D only in a few markets abroad. On the other hand, the disc offers outstanding A/V, a couple of deleted scenes, and one solid featurette. Picture quality handily recreates the film's 2D theatrical presentation, with deep blacks and good shadow detail, which is especially important for a film with a generally dim look and a number of low-lit interiors and nighttime exteriors. Color proves rich and accurate to the filmmakers' design, and there's nary a sign of compression artifacts. Typically, Disney also blows out the stops in the audio department: the DTS-HD Master Audio 7.1 lossless mix is just the ticket to maximize the raging-seas soundscape while also expertly handling subtler shoreside effects, all with the (successful) intent of audience immersion. Discrete placement of razor-sharp effects in the soundfield play nicely with the dialogue, which miraculously stays (centrally) above the fray, while music gets a full-bodied treatment. Bonus features include the Deleted Scenes "A Desperate Idea" (2:34, HD) and "The Story of How They Met" (1:53, HD) and the featurette "Against All Odds: The Bernie Webber Story" (14:10, HD), which allows production talent and Chatham locals to reflect upon the town, its history, and Webber in particular, with interstitial clips. Rounding out the disc are four short promo-style bits: "Brotherhood" (1:49, HD), which looks at the bond amongst the primarily male cast, fostered by the shipboard scenes and codified by the leadership of "number one on the call sheet" Chris Pine; "Two Crews" (2:02, HD), establishing the parallel seafaring storylines; "What Is Your Finest Hour?" (1:02, HD), with a Coast Guard officer's account of action, chased by an ad for the film, and "The Finest Inspiration: The U.S. Coast Guard" (1:42), an ad for the Coast Guard itself. All site content © 2000-2019 Peter Canavese. Page generated at 04/25/2019 02:38:09PM.